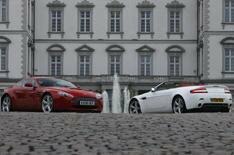 Aston Martin's even faster V8 Vantage | What Car? Aston Martin has made a range of changes to its V8 Vantage model to make it faster, better-handling and smoother to drive. The big change is the engine - it now has a larger 4.7-litre V8, rather than the previous 4.3. The increase in capacity gives the car 10% more power and 15% more pulling power. The new engine has 420bhp and 310lb ft, which takes the car to a top speed of 180mph, with an improved 0-60mph time of 4.7 sec. With the Sportshift semi-automatic transmission, economy and carbon dioxide emissions are also improved by 13%. Both the Sportshift and the manual gearbox have undergone improvements, too. They have a modified clutch and flywheel, which makes them lighter. In turn, this means less clutch pedal effort from the driver and increased engine responsiveness. There's also new software for the Sportshift gearbox, giving the engine a smoother response in 'Comfort' mode, and making accelerator responses more aggressive in 'Sport' mode. The chassis and suspension have also been modified slightly to improve body control and the low-speed ride quality. The steering has been altered, too, to give more feel. Other changes include a new centre console made from die-cast zinc alloy, a new hard-disk (HDD) satellite-navigation system, and a new range of 19-inch alloy wheels. Aston Martin hasn't released prices yet, but the new cars will be in showrooms in the autumn.